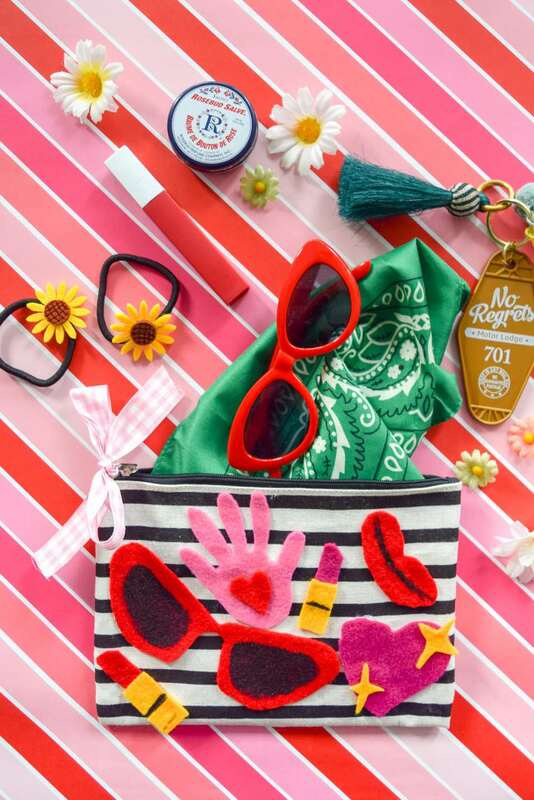 Fun, colorful, and cool, these crafts were made for the lazy, hazy days of summer! From seasonal accessories to outdoor games, fill your time with crafts and DIYs to enjoy all summer long. Are you hosting a barbecue or backyard get-together for your friends? Serve them drinks in these cute watermelon mason jars. A little bit of spray paint and these jars make lovely drink holders that will complement any summer party décor. Rattan or bamboo purses make for the perfect fashion accessory in the summer months. Add a splash of color to your purse with bright tassels–a cute and straightforward way to upgrade your summer purses without breaking the bank! This summer, why not host an ice cream party for your friends? Everyone likes ice cream, and it's the perfect excuse to get together with your buddies! Print the party details on the paper ice cream scoops, and include a real ice cream spoon with the invitation. How charming! Help beat the summer heat with these super cute printable paper fans. All you have to do is print, fold, and paste. You'll love the whimsy of these fans and these paper cuties will be keeping you fresh on those hot summer days! Not a fan of the last craft? These watermelon fans are a great alternative! Throw a watermelon themed bash and hand these out to all your party guests so they can stay cool. Badminton birdie flowers are a fantastic craft project that children will love. Kids between the ages of 8 to 12 should be able to construct the badminton flowers without much supervision. Younger ones might need a little help from an adult. Shuttlecocks usually are sold in packages of six or twelve and are quite inexpensive. Make some of these flowers as a gift for Mom! Put your stamp onto an inexpensive wooden serving tray from your local discount store. Choose some craft paints in summer colors and paint "blocks" onto the bottom surface of the serving tray. You will have an instant upgrade that looks like it came from an expensive home decor store. These trays are so pretty, you might want to make several as gifts for your friends! I scream you scream we all scream for ice cream! These cones are made from paper and filled with candy and little gifts, making the best summer party favors. Fill the paper ice cream cones with treats but keep it a surprise–let your kids or party guests figure it out themselves! The discovery of hidden treats will add to the fun. Ice Cream Cone Surprise Ball DIY from Oh Happy Day! Make an ordinary white ceramic mug festive with glass paint markers. The author of this tutorial decided to decorate the cup with geometric and triangle shapes, but you could use any design of your choice and still get excellent results. As a bonus to this craft tutorial, you will learn how to decorate wooden rounds that can be used as coasters. Give your kids a thrill this summer vacation and decorate their drinks with cute paper daisy drinking straw charms. Print the flowers on heavy cardstock, cut with craft scissors, and punch a center hole. Write the kids' names on the flowers with a marker, so everyone will know which drink is theirs. So easy and so much fun! Decorated straws are perfect for kid parties or everyday use. Turn regular Rice Krispie treats into something extraordinary this summer. The treats are transformed into "watermelon slices" with the help of gel food coloring and chocolate chips. This watermelon Rice Krispie treat dessert would be perfect for your next backyard family party. They are easy to make and always a hit with the kids. Printable temporary tattoos are one fun summer craft that let you channel your inner bad boy or girl. Print out the temporary summer themed tattoos and decorate your arms and legs! Children and adults alike will love them! The tattoos include a flamingo, a rainbow, a lobster, watermelon, candy, and an ice creme cone. There is something for everyone! Pressed flowers are making a comeback. This tutorial will show you a trick to drying flowers without losing their brilliant colors–you won't believe how it's done! Make your outdoor parties festive and unique with this paper craft. Buy some simple white bowls at the dollar store, and then give them an upscale look with tissue paper circles and some Mod Podge. Although the dishes are not washable, they are cheap to make and perfect for a summertime get-together. After the party is over, merely throw the bowls out, or if they are still clean, wipe with a damp paper towel and repurpose them. They make great storage for all the little odds and ends you have around the house. Playing Twister is a part of most people's childhood recollections. You can make an inexpensive DIY version of the game and introduce your children to this fun activity. Become a kid again and make some family memories with your children as you play this classic game. These happy paper cactus plants are so easy to make, your children can join in on the fun. Use these sweet paper succulents as party decor the next time you throw a cookout. So cute! Add some summer fun to your clutch purses with cute felt emoji shapes. What a sweet and playful way to show off your artistic side! All of the supplies for this project can be found at the dollar store. At these prices, you can make several to coordinate with all of your outfits! We all love home decor projects that are inexpensive! Give your room that tropical feel with palm leaf wall art. The example is made from gold paper, but you could also use a dark green colored paper to achieve an organic look! Either way, this project is simple, inexpensive, and will bring a taste of summer vacation to your home decor. This summer, pack a cute and colorful bag with beach gear or picnic supplies. Take an ordinary tote bag and make it special with your artistic touches. Now you are ready to go to the beach in style! The sound of wind chimes is a sure sign of beautiful weather! Are you a Star Wars fan? Now you can have DIY wind chimes that are similar to the wind chimes in Jabba the Hut's palace! You will be the envy of all your friends. Although the wind chime looks as if it's made of metal, it's actually constructed from PVC pipes.